1. 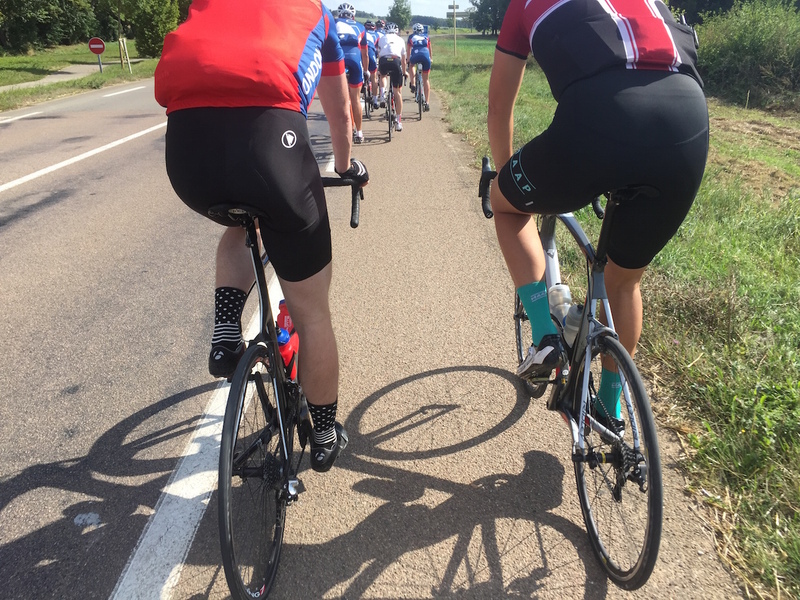 Being part of a team that works together to ride bikes 1,000 miles between London and Monaco (in 10 consecutive days!) in the fastest and most efficient way possible. 2. Experiencing the joy, camaraderie, and satisfaction that comes from tackling big challenges and working together to accomplish both long and short-term objectives. 3. 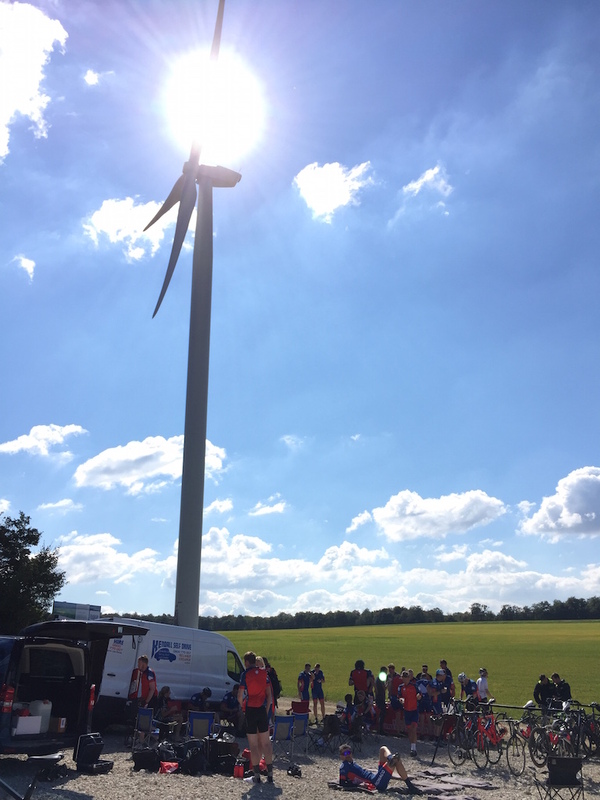 And most importantly, use all the positivity and notoriety the ride is receiving to help the Blue Marine Federation raise over £500,000 so they can continue to tackle some of the most important environmental challenges of our time. And that’s exactly why the whole team at the UK-based design firm, Winch Designs, have invested so much to time, energy, and manpower to help get the inaugural London Monaco Ride get off the ground. They use skill, talent, and teamwork on all of their projects just they way the folks at Blue Marine Foundation are tackling the significant environmental problems that are caused by overfishing and will significantly affect future generations. 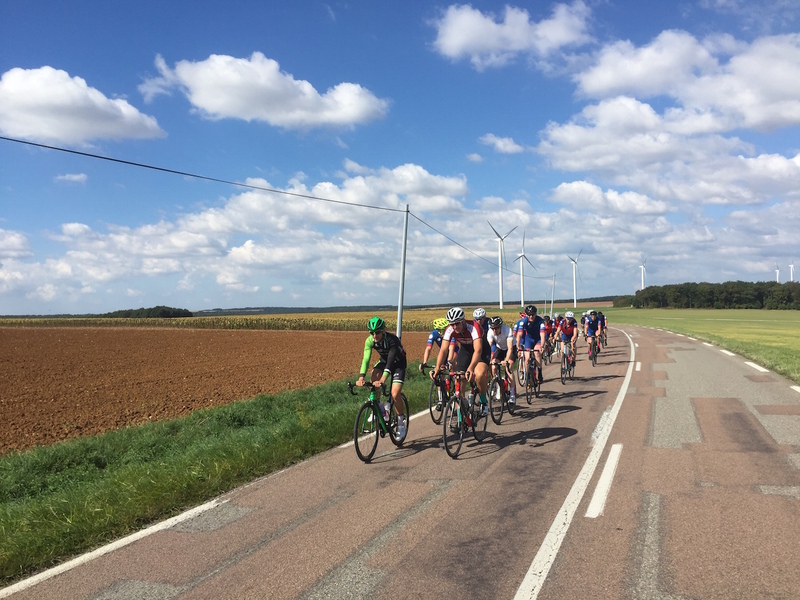 And there may be no better metaphor for using teamwork and courage to overcome big challenges than getting good-sized group of cyclists of all shapes, sizes, experience, and nationalities together to ride 1,000 miles in 10 days. Knowing that this ride is more than just a ride makes all the hard work (and the fun too) we are having on this adventure so worthwhile. And can you imagine what would happen if we could get our world leaders to simply go on a long, and especially well-supported bike ride? Sure the security would be a nightmare but that chance they would have really work on real solutions to the many challenges we all face would be extremely powerful. So, I hope you are enjoying these updates from the ride. I love writing them and yes, we are having an amazing time. But we are also riding for a higher cause–the health of our oceans that we will be leaving to our kids. So please consider making a donation to the Blue Marine Foundation as we do this little Stage 4 recap. It will make a difference–like when the sun comes out after you’ve been freezing on the bike all misty morning long! It was crazy really. One minute we’re all jacketing up in the that was captured in the lead shot. The next minute there’s sunny skies and cotton-ball clouds. And then we started rolling. Like really rolling. See those two guys on the front of our group? They are pro cyclists. They are strong, fast, and most importantly for guys like me, willing to answer my dumb questions with a smile–as we really rolled along. And then it was time for lunch. Except the guides from LaFuga (who are really top-notch) misjudged where the lunch stop would be, so….it took a wee bit longer to get there than we anticipated. 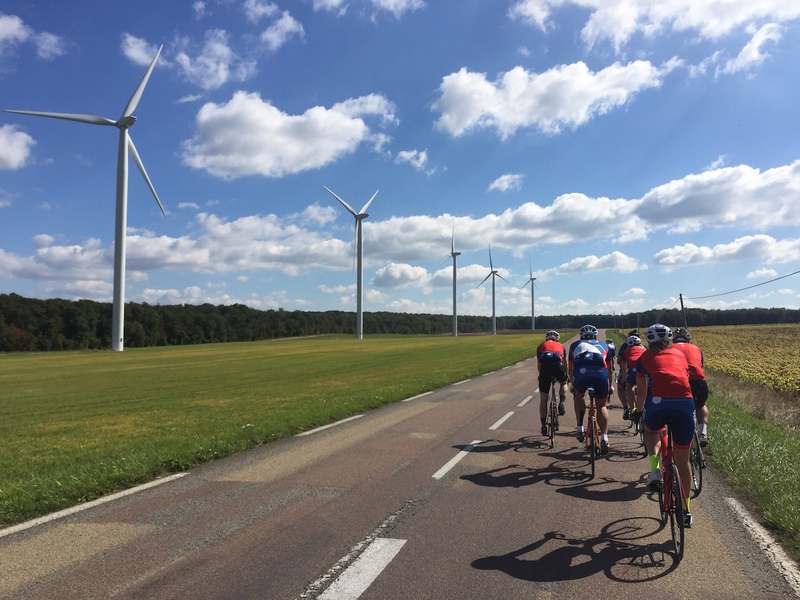 But as you can see, the lunch spread at the base of these majestic windmills (complete with mid-ride massage) sure did make up for the delayed gratification…. Yep, I got a mid-ride massage in addition to several jambon fromage on a baguette sandwiches that were topped off with my new favorite thing. 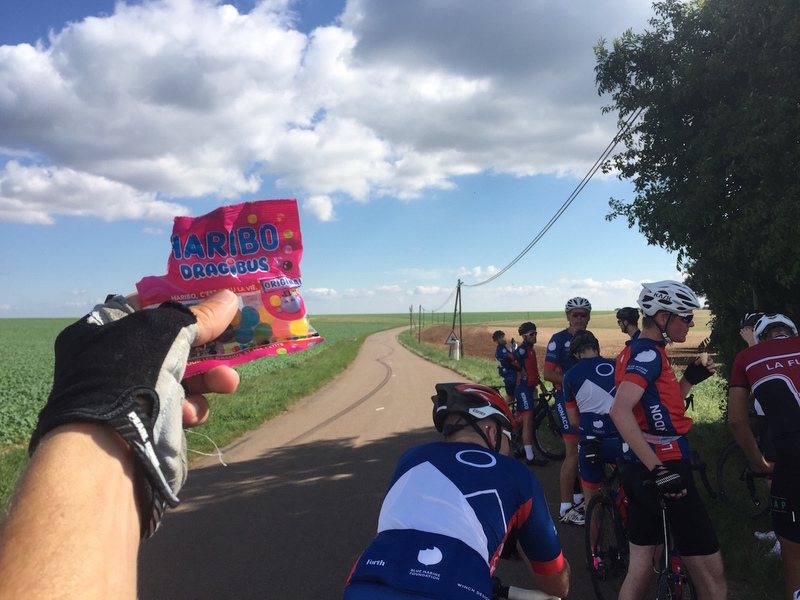 Haribo. The little sugar bombs I pounded at the base of the 2.5 mile climb at the end of the day provided an interesting kick. And then all we had to do was settle in behind the two of most draft-friendly guys in the group. And I’ll leave it to you to figure out what makes them so good. So please, give what you can to Blue. Billie….day 4 and still looking good…hats off to you man…and when you get back to boston…you will pull us around concord/lexington for a long time…given the shape you will be in!!! Who are the pro’s riding with you???? Loving your updates, your will and your fitness level to pull this off. Those super Euro Haribo snacks are dangerously close to being called “DragiBut” so I would be careful. Pedal on, Swizz!